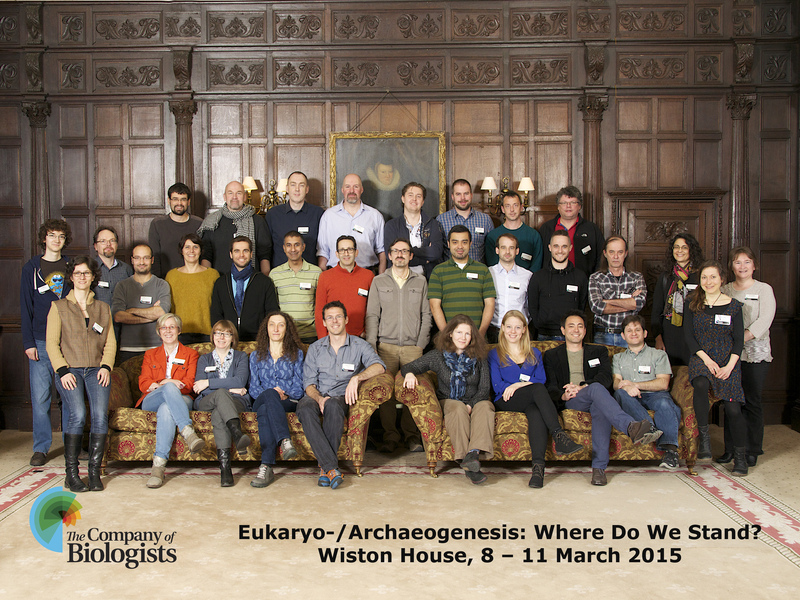 Eukaryo-/Archaeogenesis: Where Do We Stand? Elucidating the nature of the relationship linking Archaea and Eucarya is at the crossroads of many research fields, including molecular phylogenetics, genomics, paleogeology, biochemistry and cell biology, amongst others. Recent advances in these fields include: the discovery of typical eukaryotic features in Archaea and bacteria; the inference that the last common ancestor of Eucarya was very similar to present day eukaryotes; the discovery of 2.1 Gyr large colonial fossils that could represent ancestral eukaryotes; an unsuspected diversity of archaeal lineages, some of which are proposed to be at the origin of Eucarya, etc. However, important questions remain, and it seems that we might have reached the limit of what we can infer from each field separately. Overcoming this ‘impasse’ to gain further understanding of the relationships between the three domains of life now requires the integration of data from different fields. Unfortunately, dialogue among those communities has been quite scarce. The aims of this meeting are to bring together as diverse a group as possible of experimental and theoretical biologists who are interested in eukaryo- or archaeogenesis to promote dialogue in order to bridge the gap between these communities. To do so, we aim to gather the most prominent players from these research fields. We are organising this interdisciplinary workshop because we believe it is now timely to bring together a group of experts to discuss the current state of knowledge about eukaryo- and archaeogenesis and how we can learn from each other. All the invited speakers are using different methods to address different problems related to the origin of those domains, which makes this a particularly valuable workshop for cross-fertilisation of ideas and techniques. Thin section of Gemmata obscuriglobus with numerous membrane-limited areas. 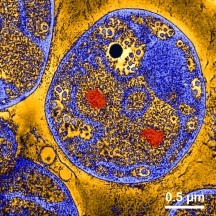 ‘Riboplasma’ (yellow), ‘Paryphoplasma’ (blue), DNA (red), polyphosphate inclusion (black), modified from Santarella-Mellwig R et al., PloS Biol (2013) 11: e1001565. Image credits: Rachel Santarella (EMBL, Heidelberg, electron microscopy) and Harald Engelhardt (MPI, Martinsried) for false coloring.